Marble. 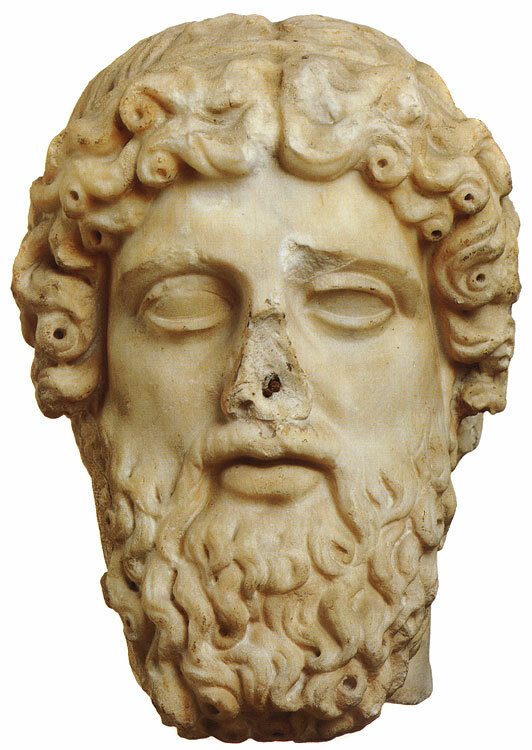 Roman copy after a Greek original of the late 5th century BCE. Height 38 cm. Rome, Capitoline MuseumsInv. No. 3310. This head is characterized by thick hair, sometimes described as a veritable mane, which covers the head and ears and frames the entire face. This type of statue used to be compared (by, i.a., Curtius and Lippold) with the Dresden Zeus sculpted by Agorakritos, the favourite pupil of Pheidias. With the exception of a bust in Munich and a piece in the Museo Nazionale in Rome, all other attributions are now rejected by G. Vierneisel-Schlörb (Glyptotek München, Skulpturen II, Munich 1979, p. 147). Given that we are dealing with a Roman copy, albeit one that is very little known, its faithfulness is open to doubt. The resemblance may merely reflect a very common type of statue. Le sport dans la Grece antique (Brussels, 1992) no. 128 p. 266. © 1993. Photo, text: Olympism in antiquity. Olympic Museum Lausanne. Bertelsmann UFA. Industria Gráfica S. A. Barcelona, 1993, p. 65 cat. no. 8. © photographer — Araldo de Luca (Rome).